It's all good bro, carry on. Much appreciation for the vBench startup. That is what it is all about. The more, the merrier. Yeah this Panther is becoming a project. Sigma-7 was kind enough to send me a PDF of the Sept 1990 issue of FSM which has a fantastic article by Tony Greenland about accurizing the Tamiya 35065 Panther kit. There is some great info in there about scratching a new turret, which seems to be one of the worst parts of this kit. 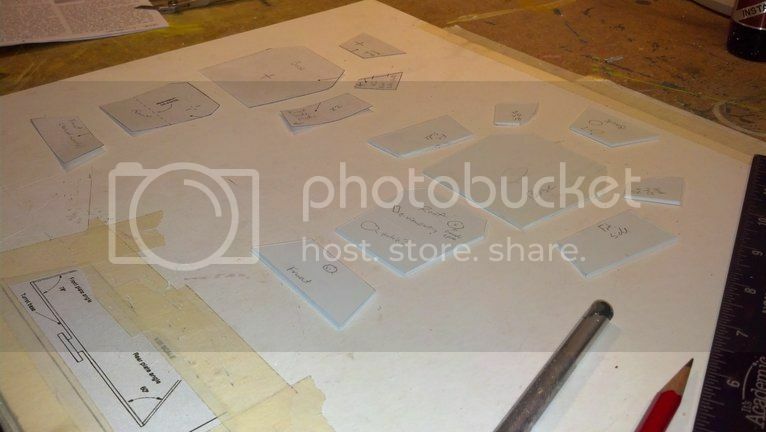 Mr. Greenland even has a template to build a new turret. 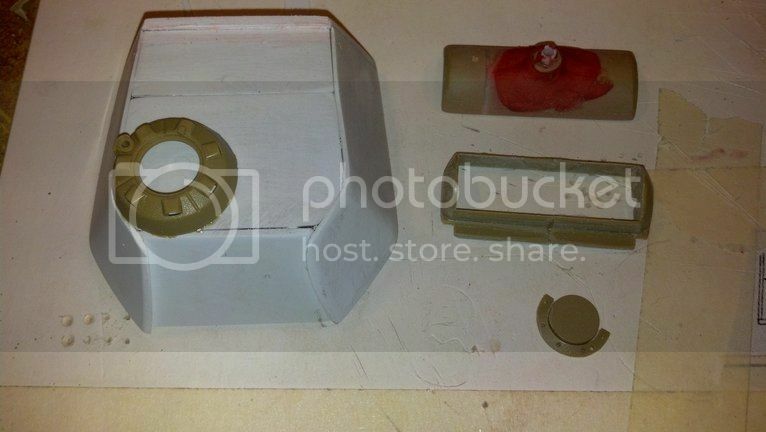 Now whether I misunderstood Mr. Greenland's instructions, or he may use a little different method than I'm accustomed to using for scratch building, but at any rate I had extreme difficulty with assembling my turret using his template, to the extent that I scrapped the first one and started over. 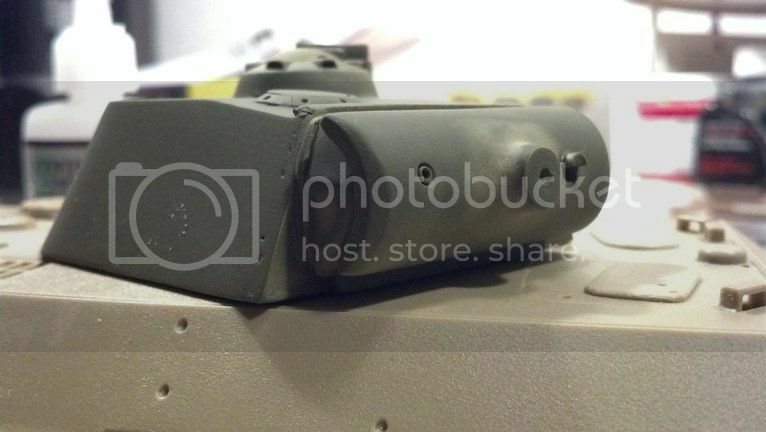 Most of the pieces seemed to be correct except for the back plate of the turret. The top edge of it seemed way too short in length to complete the journey to the outside corners of the turret. His article and template were not total losses by any means though; on the contrary. 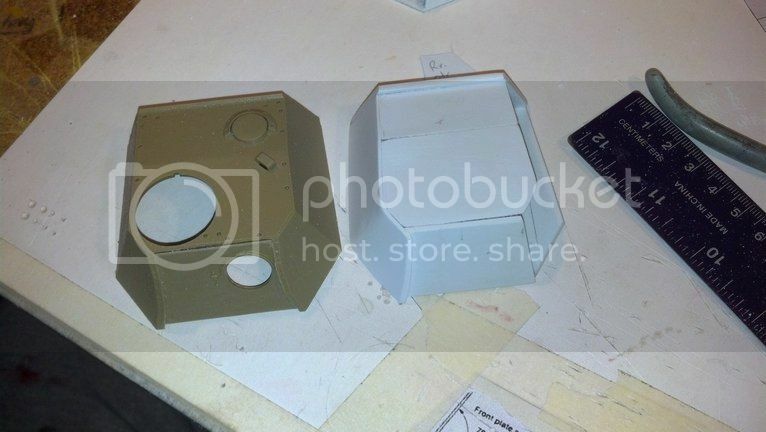 The basic size, shape, and construction of the turret he suggests will produce a great representation of the Panther turret I think. I just had to do some tweaking, and there is an abundance of other great info in his article. Starting over I used Mr. Greenland's base template, the front plate, and roof plate. I made a new back plate using my own judgement guided by another diagram by Steve Zologa from the book Armor Conversion And Detailing Projects, also put out by FSM and Kalbach Books. From there I attached the front plate first, then the back plate, setting the proper angles for these plates (per Mr. Greenland). I then attached the roof in 2 seperate pieces, back first, set level to the bottom edge of the turret, then the front section, which has a very shallow incline from front to back. 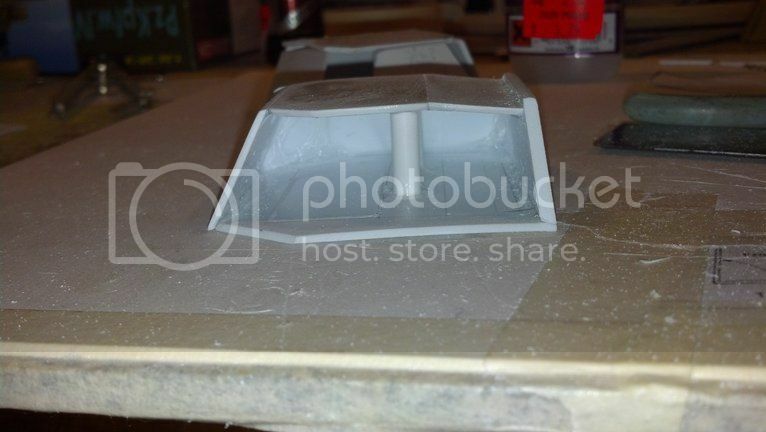 I reinforced the interior of the roof to prevent distortion using some 1/4 inch styrene tube and CA. 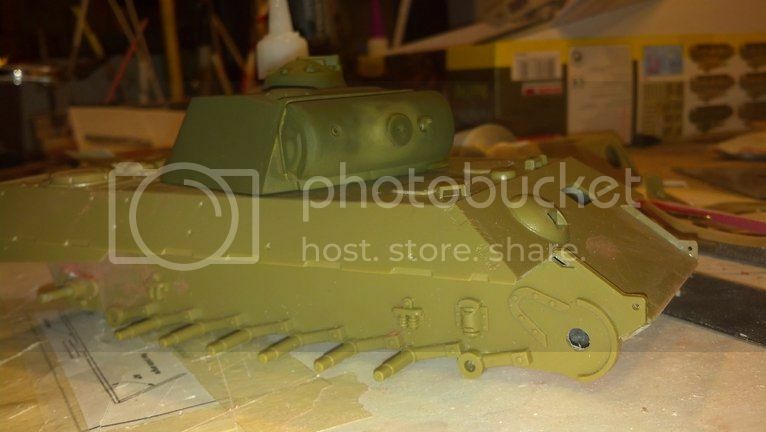 I then took some thinner styrene sheet (sorry...dont know what thickness) and began forming the sides of the turret, as they appear to have been on the real Panther. 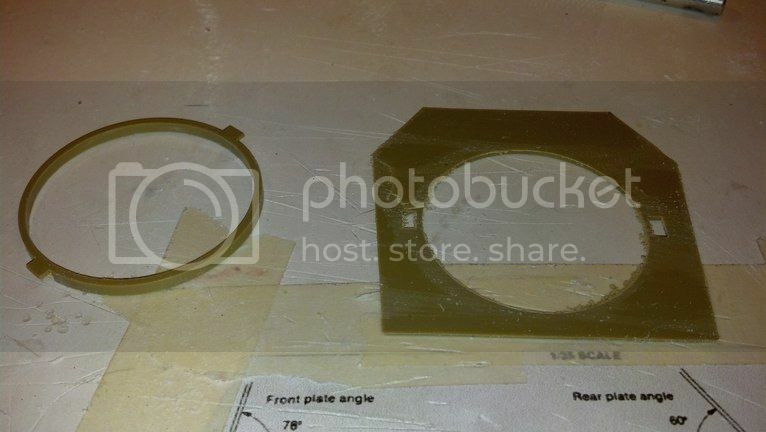 I cut a strip slightly oversized, trued-up the front edge where it meets the front (mantle) plate. I poured in the CA on the inside, dabbed some accelerator, then carefully bent it around the rear quarter of the turret, CA'ed it. From there it was just trimming with a knife and filing and sanding. I still need to do the other side, but the hard work is done! The size difference is obvious here, as well as the overall inaccuracy of the shape. I trust Mr. Greenland and Mr. Zaloga's measurements more than Tamiya's, especially considering that Tony and Steve's dimensions were identical for the most part. Thanks again sigma-7...though the template gave me fits, I couldnt have done it without it and your help! Just happen to have it. 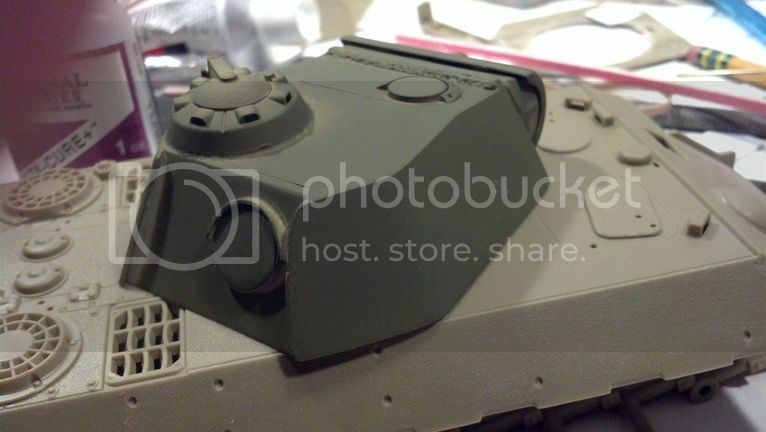 I think I had read in other forums that the Tamiya kit was originally a motorized one and the dimensional issues may have stemmed from Tamiya altering the design to accommodate a motor and batteries. The other issue regarding the center/inner road wheels, if you really wanted to correct it, you'd have to either get after market wheels or cast copies of your own. Youre correct sigma...in fact i think in that article he mentions it. There is also an article in the book i mentioned about this kit, and while they make no mention of the dimensional inaccuracies, they do mention the road wheel problem. 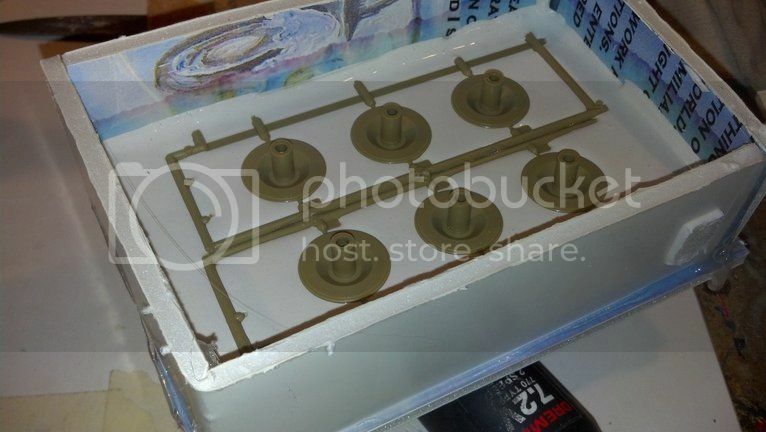 That author's solution was to obtain another kit, but i'm gonna give casting my own a shot, in fact i make a mold of the kit's wheels today. I'd like to try to cast them from molten styrene, but make just do it in resin. Well I continued on the turret work today. I think I got it nailed pretty closely. It looks a tiny bit too small for me, especially sitting on the supposedly oversized hull, but all my measurements come out really close, if not dead-on. 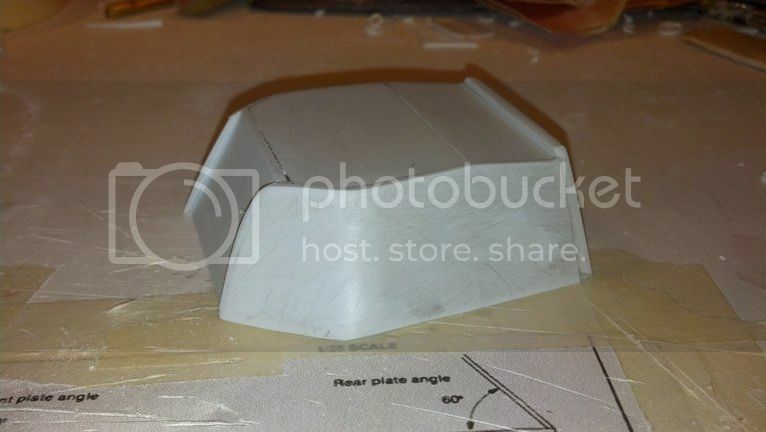 I finished attaching the starboard-side plating on the turret and gave it an overall sanding. After that I began designing an elaborate assembly to mate it to the hull. I wanted it to still turn, and in the end I just ended up sawing off the ring from the kit baseplate and attaching it to the bottom of my scratched turret. Now I'm moving on to detailing the turret. I'm using some kit parts, and scratchbuilding others. 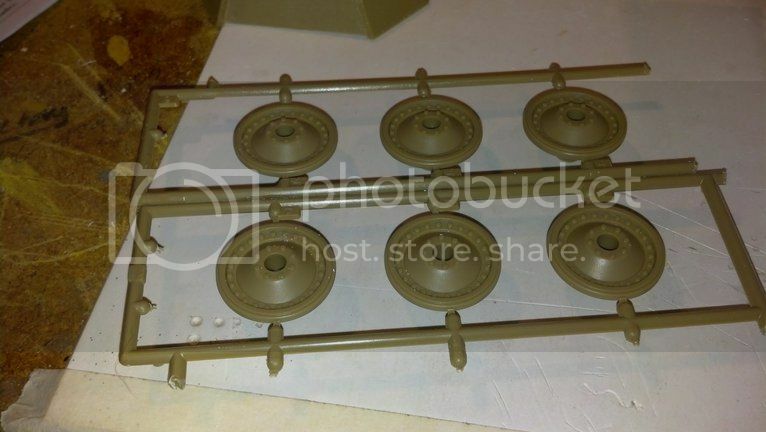 For some of the kit parts I have to saw them off the Tamiya turret since they are cast in. 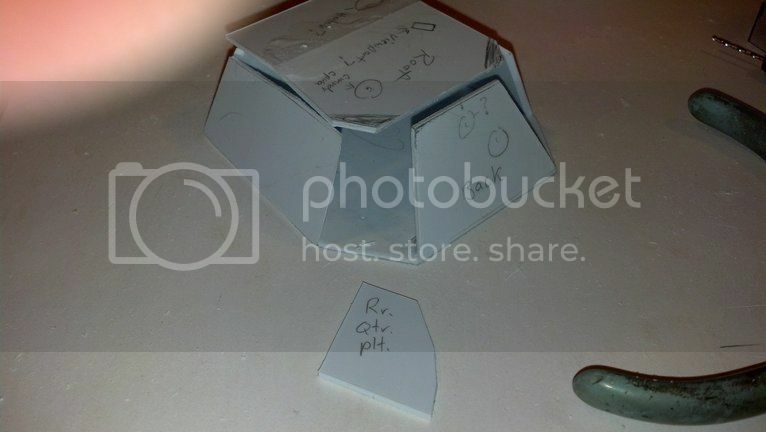 The template I used had location marks for the hatches. I also narrowind the mantlet, which ended up being way more work than I was prepared for. I goofed when I did it and the main gun was offset, so I had to remove it completely, fill the resulting hole with CA, remeasure, drill, and apply a new assembly. 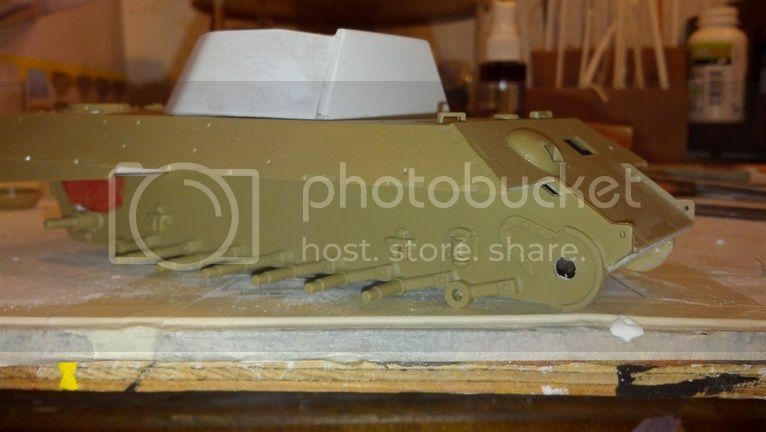 In removing the old gun housing from the mantlet, it was destroyed, so I'm using plastic, CA, and filler to build the area back up and shape it back to what it should look like. For the 8 missing inside road wheels that the Tamiya kit is missing, I'm attempting to cast my own. 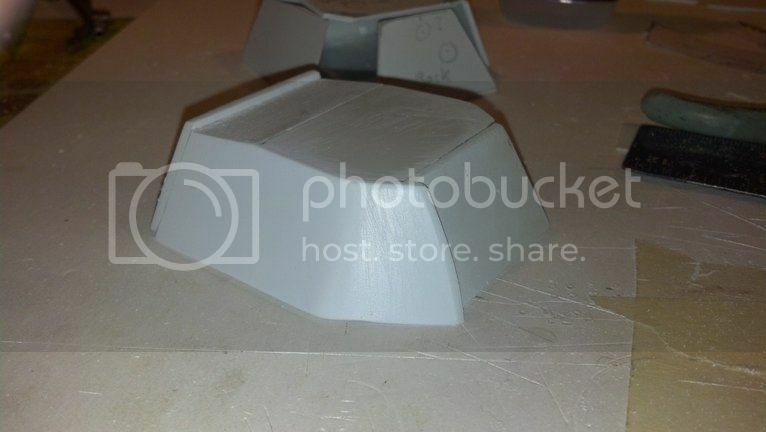 I've done a little resin casting in the past, but never using a plaster mold. If this doesnt work I'll get some RTV and redo it, but I thought for a little work I'd give it a shot, and I had the plaster on hand. I left the road wheels on the sprues, but I bunched 6 of them together and glued the sprues together to make it more compact. I need 8, but I figure I'll make 3-5 castings anyway. I then poured the plaster into the mold, and since my mix was somewhat stiff, I was able to press the pieces into the plaster. We'll see what happens! Thanks kuklintski! I think it might. 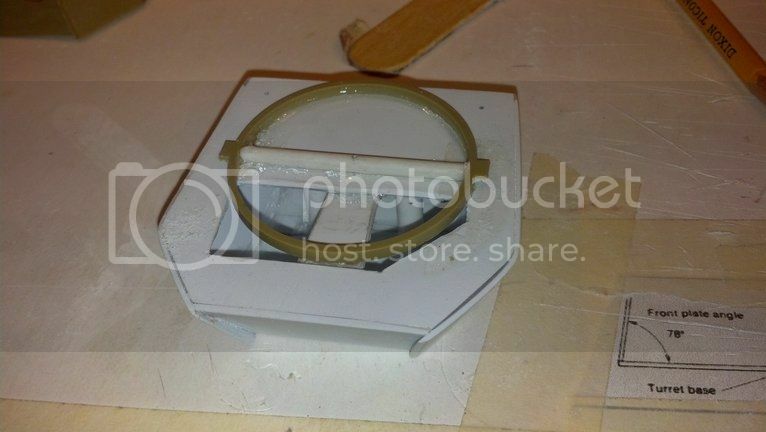 My plaster mold for the roadwheels didnt turn out. I can easily get another kit or set of resin roadwheels for well under the cost of a resin casting kit, so I'll probably end up going that direction instead. I did get a bit more work done, but no photos yet. I'll try to post a photo update late tonight or tomorrow. yeah, this thing has turned into alot of work, but I think the worst is behind me. Should make a nice model when it's done. I'm trying to make it a good one while staying away from the aftermarket, not that I have a problem with aftermarket suppliers. Thank goodness they are around, and they provide some fantastic materials to us. I'm just trying to do it on the cheap and using my own imagination and abilities. I've completed most of the work on the turret, but alot of detail work still needs done. I gave it shot of primer just to get an idea of where it's at and what it needs. Plus the stark white of it was fooling my eye, and it just didnt look right. The OD primer makes things look better. 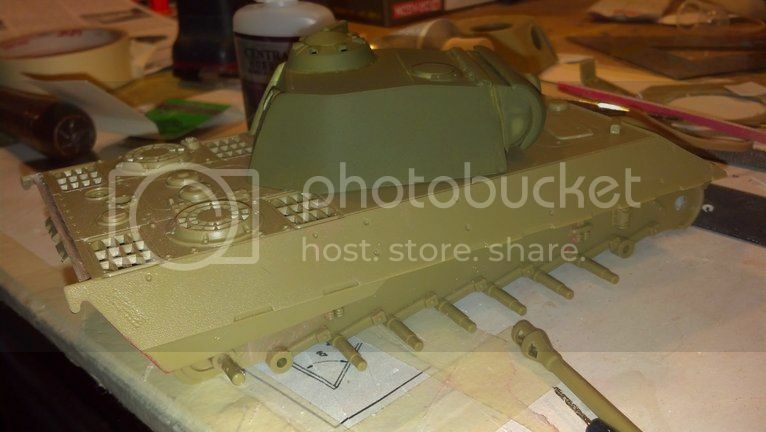 I added a brass tube machine gun for the mantlet, a hood over the gunners sight hole, and a hood over the rear hatch. I've also started sculpting welds. 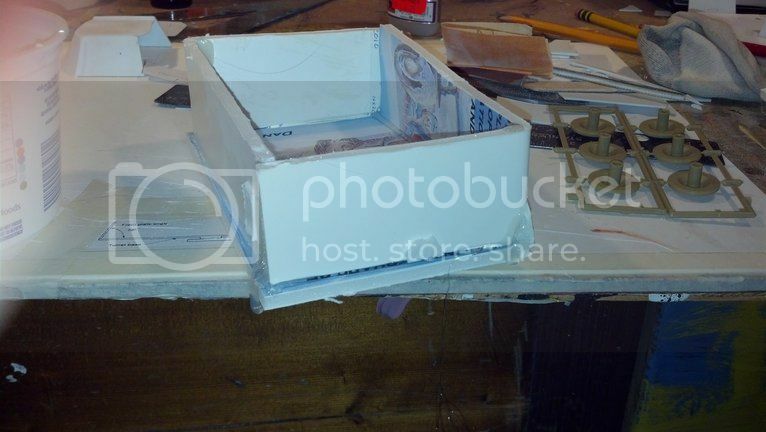 As for the main hull, I havent touched it much, though I did get it together. The fit is...okay. Still alot to do. My mold for my extra road wheels didnt turn out well. I think I'll source the aftermarket for these. Anyone know a good manufacturer/supplier, preferably in the States? Thanks everyone!